WASHINGTON, DC -- ?During U.S. Rep. Harold "Hal" Rogers' (KY-05) opening statement at the U.S. Department of Agriculture's (USDA) fiscal year 2015 budget hearing, he commended Secretary Thomas Vilsack for his recent visit to southern and eastern Kentucky and the agency's partnership for the Shaping Our Appalachian Region (SOAR) Initiative. 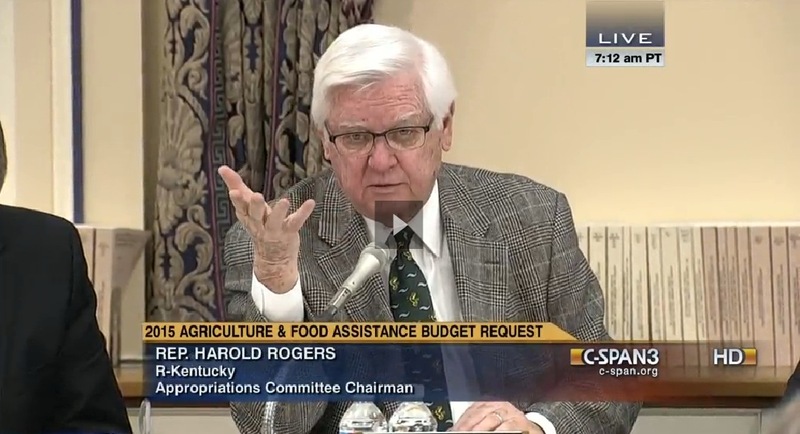 As Chairman of the House Appropriations Committee, Rogers also questioned several funding elements in the USDA budget proposal, pointing out that the agency's "artificially low estimates" in recent years were drastically increased by the middle of the year. Rogers highlighted his concern for the USDA's proposed cuts to rural housing programs and the impact such cuts would have in rural parts of the country, specifically in southern and eastern Kentucky. USDA witnesses included Secretary Thomas Vilsack, Chief Economist Dr. Joseph Glauber, and Budget Officer Michael Young. "Mr. Chairman, thank you for yielding. Secretary Vilsack, I appreciate you being with us today to discuss the Fiscal Year 2015 budget request for the Department of Agriculture. Because Ranking Member Lowey and I have committed to move all twelve appropriations bills through subcommittee, full committee, and the floor, we plan to move our process along at a brisk pace this year. Unquestionably, this return to regular order is critical to crafting bills that wisely expend taxpayer dollars. The FY14 omnibus package is a prime example of what we can accomplish together: this committee was able to provide every facet of the federal government with adequate, responsible funding, while continuing to reduce federal spending – totaling $165 billion in cuts since fiscal year 2010. "We have had to work hard to bring about these discretionary reductions. It has taken a lot of late nights and compromise, but we have gotten it done. Now we need to tackle our mandatory spending problem. Today, mandatory spending accounts for two-thirds of the federal budget, which is a stark contrast to how it was when I first arrived here and mandatory spending was only one-third of the budget. This runaway spending threatens to squeeze out all of the worthwhile programs that many of our constituents care for – from education to medical research, to housing assistance and farm loans. Yet, I see no leadership from this Administration to tackle this issue in the budget and mandatory spending comprises 86% of your department’s request. While UDSA’s budget proposes to lower both mandatory and discretionary spending within the department, we have heard this before. And over the last few years we have seen your artificially low estimates on mandatory spending blown up by the middle of the year. It’s time to get serious about this mandatory spending problem and have an honest discussion about it. You cannot hide behind phony estimates. "Once again in this year’s budget, the request proposes a significant cut to the Section 502 Direct Loan and the Mutual and Self Help Housing programs. We have seen this kind of smoke screen time and again from this administration: where funding is cut for useful programs in order to make room for new spending and create the illusion of budget savings. The concern I have is that this shows a disrespect for our rural communities and the constituents who have made these programs successful. In my district, Kentucky Highlands—through its Self-Help Housing program—has completed 20 homes and currently has 6 more under construction using Section 523 Self-Help technical assistance and Section 502 Direct Loans. For example, one woman in my district just finished building a 3-bedroom home for $98,000. If she had used a contractor, that same home would have cost $145,000 to build. The rental home where she and her young daughter previously lived was so poorly insulated that she kept the thermostat at 52 degrees in the winter, just so the electric bill would stay at or below $500 a month. Her electric bills are now expected to average around $100 a month in her new home. Another single mother in my district used these programs to build a 4-bedroom home for herself and her 4 children for $102,000. If she had used a contractor, that same home would have cost $148,000 to build and it would not have been possible without the Section 502 Direct Loan program and the sweat equity earned through the Section 523 program. It seems to me that this is the sort of thing we should be encouraging, and there are a lot more hard-working people like these women who are more than happy to put in the time and effort to gain homeownership. I hope that you can begin to support this program with a little more emphasis than you have been in the budgets we have seen. "Mr. Secretary, I look forward to hearing your testimony and your plans for supporting our nation’s farmers and our rural communities through these difficult budgetary times. Thank you, Mr. Chairman, and I yield back."